Apart from the odd industrial complex that has been turned into a museum or blocks of apartments, no-one is preserving these places. There is no heritage industry in the edgelands, but what the book does do is make you think back to your childhood, and how much of a role these in between kind of places played, and beyond that, gives you new impetus to explore the edgelands that are within everyday reach and how they can be truly fascinating. Childhood plays a large role in the exploration of the edgelands, whether it is building dens on a patch of wasteland, skateboarding across industrial estates, or the bravest kid in the gang crossing the frozen expanse of canal to reach the other side. It made me think of my own teenage years in Burscough, West Lancashire, where the edgeland zones of the dead railway or the under-utilised tow path of the Rufford Branch of the Leeds Liverpool Canal were the perfect hideaways for underage drinking sessions. And then there is Berlin. The hollows and spaces of this city are not always on the “edge”. Here our edgelands might be, as elsewhere, the abandoned railway lines that once ran to stations forced underground by the violence of Second World War bombs. Or it might be patches of land right in the heart of the city cleared to build the Berlin Wall and not yet filled in twenty years and more since it came down. During the division of the city Potsdamer Platz – including a large space that was officially East Berlin but on the western side of the wall – was the ultimate edgeland, where squatters camped on what had once been Europe’s busiest intersection and the West Berlin police were unsure as to what authority, if any, they had over the activities that took place there. That unreal space right in the heart of Berlin is – like the Heysham holiday camp – nowhere to be found, as Potsdamer Platz rose again in the nineties in towers of steel, glass and concrete. But Berlin has edgelands in abundance. This is not surprising, when one considers the city’s geographic size, the almost complete retreat of industry during the long years of division, and the fact that its population is still less today than it was a hundred years ago. 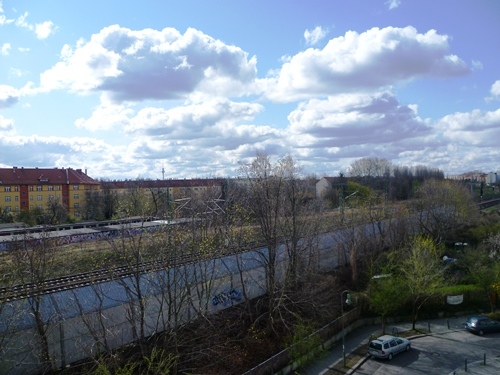 From a friend’s balcony in Pankow I look across allotments to a path along the railway line, where it looks as if another line once stood, but which has now been unofficially claimed by dog walkers and joggers. There are garages laid out for Trabants standing in rows in front of cracked asphalt through which wild plants are growing. Elsewhere in the city and on its fringes there are abandoned military bases, factory compounds, railway stations and football stadiums where trees grow on the terraces. There are out of town outlet villages laid out a discus throw away from the campus where Olympic athletes once slept and prepared for competition. There are old watchtowers and hills built out of bombed rubble and industrial parks next to what was once an international frontier. For many of the examples in the book, whether in the edgelands of Manchester, Swindon or Wolverhampton, I can think of parallels here in the German capital, and not only does it make me think of these places afresh, but inspires me to get out there and explore those that are right on my doorstep. 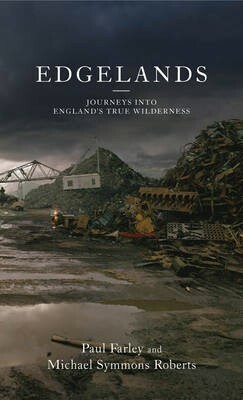 Edgelands, by Paul Farley and Michael Symmons Roberts is published by Jonathan Cape (hardback) and Vintage (paperback). If you would like to read more, then you can get a copy from your nearest bookshop, or from our friends in Berlin at Dialogue Books. They have a wonderful shop down in Kreuzberg, and they will also deliver to wherever you might be in the world. This entry was posted in Books, Memory, Reflections on April 10, 2012 by Paul Scraton.